well Bejing just like other big cities in China suffer from terrible smog and air pollution. We often experience similar smog over here in Germany and Europe. Thus not as intensive as people in China have to endure. There is another interesting difference between China and Europe. It is the way how people react to this. Over here we protest, we demonstrate for better air. We criticize politics and companies and of course all those car drivers, who better could take the train in these days. 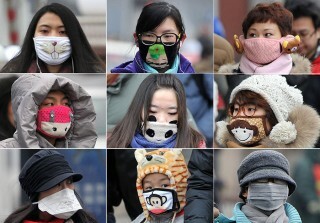 But we are not as creative as the Chinese are when you look at the wonderfully made masks. Have a look and enjoy. But don`t forget, good air, healthy breathing is one important base to live on or to live by.